Ok, gang....there's a blog I like to read, Keith's Space, and he had an idea for today, Saturday's Seven, that I really liked. And, I'm going to snag his idea and keep it going! Hope you don't mind, Keith, but I loved your post and just had to have it for myself (and give you a small amount of advertising)!!! 1. I'm missing my little guy....his father and I have joint custody so this weekend my favorite mini-fella is not home with me. I chatted with him on the phone first thing this morning, and heard this beautiful little voice, but that's just not the same as being able to hug his sweet little neck and smooch his chubby little cheeks. 2. Hubby has gone with a buddy to the Gun Show so I've got the house to myself, the crafty ideas are flowing, the hot tea is nice and sweet, and I'm feeling very content! 3. I'm missing my mamasita. Today is her 56th birthday and she lives in Las Vegas...far from me. It's too early here for me to call her so I'm waiting patiently to be able to call and sing her the usual birthday diddy. 5. I'm feeling good that I have plans this afternoon with Hubby when he gets back. We may go shooting at the range and I'm looking forward to nailing some targets with my new Sig P232. 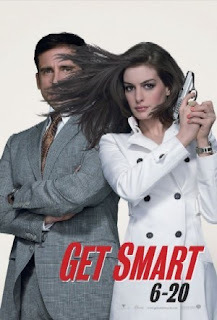 You know, Agent 99's gun on the cover of the Get Smart DVD? Very stylish! 6. I love it that every time I think or talk about my new gun (the Sig P232) I think of the movie Finding Nemo. You may not get it, I certainly don't, but for some reason Dory's repetition of "P. Sherman 42 Wallaby Way" goes through my head every time! I have no idea why saying P and a few numbers makes that connection in my brain, but hey...another example of my crazy thought processes. 7. I'm lovin' the fact that its Saturday! I just adore my weekends and hope to savor this day as much as humanly possible! Ok, it's time for breakfast. My rumbly tummy can wait no more!